Commonly referred to as the Yellow Fever mosquito, the Aedes aegypti mosquito has a worldwide distribution in tropic and subtropical areas and has recently been found in different locations throughout California. • Aedes aegypti is a small, dark mosquito with a white violin shaped marking on its back and banded legs. • Aedes aegypti has the ability to transmit dengue fever, chikungunya, yellow fever, and other viruses. 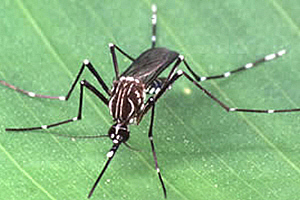 Aedes albopictus, commonly referred to as the Asian Tiger mosquito, it is native to Asia, was re-introduced to Los Angeles County in 2011, and has spread throughout neighboring areas. 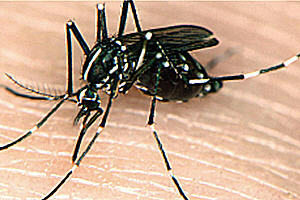 • Aedes albopictus is a small, dark mosquito with a white stripe on its back and banded legs. the following viruses: West Nile, Eastern equine encephalitis, and Japanese encephalitis. It can also transmit dog heartworm parasites. that feed both indoors and outdoors. • They are approximately – ¼ of an inch in size. •Their peak feeding times are during the early morning and late afternoon, however they will bite anytime during the day. • They prefer biting people but also feed on other domestic animals — mostly mammals. • The entire aquatic cycle (i.e. from egg to adult) can occur in as little as 7–9 days. The life span for adult mosquitoes is around three weeks. • They have a short flight range, so egg laying sites are likely to be close to where the mosquitoes are found. • Eggs are laid, sometimes on dry surfaces, over a period of several days, are resistant to drying out, and can survive for six or more months. • These mosquitoes remain alive through the winter in the egg stage, and when the eggs are covered with water in warm weather, the larvae hatch. A local species, Aedes sierrensis, also known as the Western tree hole mosquito (pictured left), is similar in size and also bites during the day, but it lacks the white stripe on the back and is more drab in coloration. It can be mistaken for the Asian tiger mosquito. This species is usually prominent in areas with older trees, and is active from April through July. 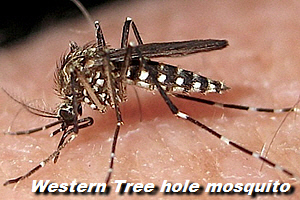 Western tree hole mosquitoes are capable of transmitting dog heartworm disease. Help us protect public health by learning how to identify invasive mosquito species. Early detection of these invasive mosquitoes will help us control them. We can’t do this alone. We need your help. Always report mosquito problems, especially aggressive daytime biting mosquitoes, to the Contra Costa Mosquito and Vector Control District by calling us at (925) 685-9301 or by contacting us here on our website. A fact sheet provided by the Centers for Disease Control. Is it an Aedes aegypti or Aedes albopictus Mosquito? Another fact sheet courtesy of the Centers for Disease Control details the differences. Courtesy of the California Department of Public Health. Another informative fact sheet from CDPH detailing information on yellow fever. 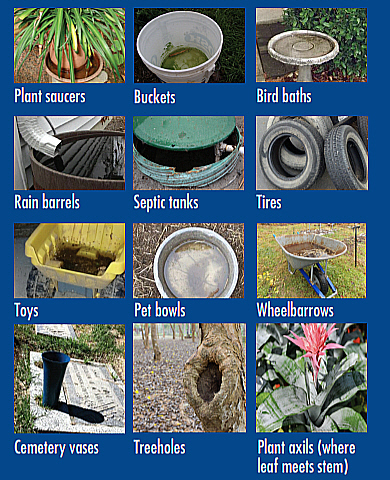 Courtesy Contra Costa Mosquito & Vector Control District.